We are an eminent name, which is engaged in delivering Water Softener Plants. The offered range of water softener plants is available in different customized specifications to comprehend and meet the diverse requirements of esteemed clients. Along with this, we provide suitably installation and maintenance services for these water softener plants. This range is acclaimed for its durability and reliable performance. 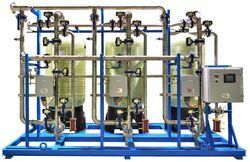 Considered in the market to be one of the leading manufacturers and suppliers of quality Industrial Water Softening Equipment, we manufacture these plants using raw materials of the highest grade. Used for the purpose of converting hard water into soft water, the efficiency it provides is considered to be one of best that is there in the market. Further, its sturdy and corrosion resistant construction and long functioning life makes it a highly praised product. Looking for Water Softener Plants ?